Use of materials with maximum durability and resistance to water, chemicals and damage. They are rectified in combination with the aluminum board to guarantee the perfect planimetry of the table over time. 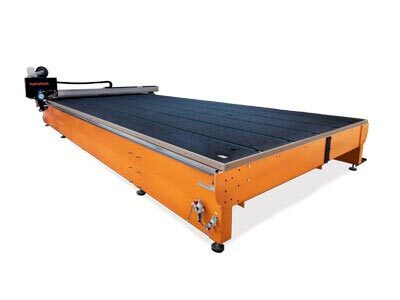 The machine automatically calculates the rotation of the glass on the table and applies the pertinent software level correction, making the physical squaring of the sheet unnecessary. Prior to cutting each new sheet, the machine automatically detects the thickness of the glass and checks that it matches the one entered by the operator. This measure avoids possible human errors while ensuring the use of the appropriate cutting parameters for each glass thickness. The RUBI series uses an oversized, double-guided transmission system that prevents contact loss, better withstands stress and increases accuracy and resistance to inertia. Self-lubrication guarantees optimum operation and ensures maintenance of the slide. The cutting head is equipped with a self-swivel cutting wheel to achieve perfect alignment in both straight cuts and shapes, ensuring maximum cutting quality at all times. The cutting machine can take the dimensions of the glass automatically. This function is especially useful when using glass remnants to prevent human errors or to automate processes. 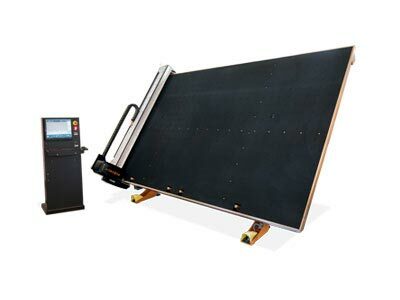 The RUBI 300 series is designed for high precision cutting on laminated glass. 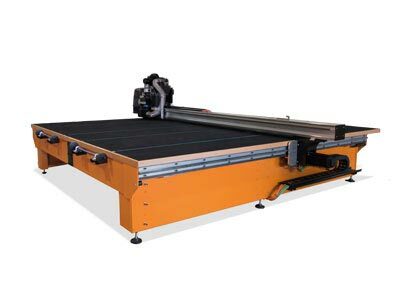 The operation is done by cutting the top side in a first step, then turning the sheet and calculating the X or Y mirror image of the cutting plane to match both layers. The different technologies applied in the process allow an accuracy of up to +/- 0.5 mm. It allows reading templates of different materials and thickness between 0 and 20 mm taking points in all its perimeter. Turomas has designed a powerful vectorization software that transforms all those points into continuous strokes. The conversion stands out for the great accuracy. Tool adapted to cut vinyl automatically. As it has the same system than the cutting tool, it keeps its functionalities achieving high quality cuts regardless of the complexity of the shapes. The RUBI series is ready as standard for cutting all kinds of shapes on glass. They can be loaded from the default library, imported from a dxf file or loaded directly through the optimization. TUROMAS cutting tables include a powerful software on the control panel as standard for creating and managing optimizations. Remote technical assistance system based on a set of software and hardware tools that allows authorized staff of the Turomas Technical Service to manage maintenance or assistance tasks anywhere in the world quickly and efficiently. Access via the Internet is always done with the prior consent of the customer. Software for editing complex shapes in dxf format or dots. In those shapes formed by a large number of individual segments, the editor can connect them tangentially to each other in order to reduce the number of cuts to be made by the machine, improving quality and optimizing processing time. Our machines can link and communicate with the main commercial optimizers on the market. The generated optimization files can be transferred to the cutting table via a USB memory stick or the local data network, considerably reducing the transmission time of cutting orders.